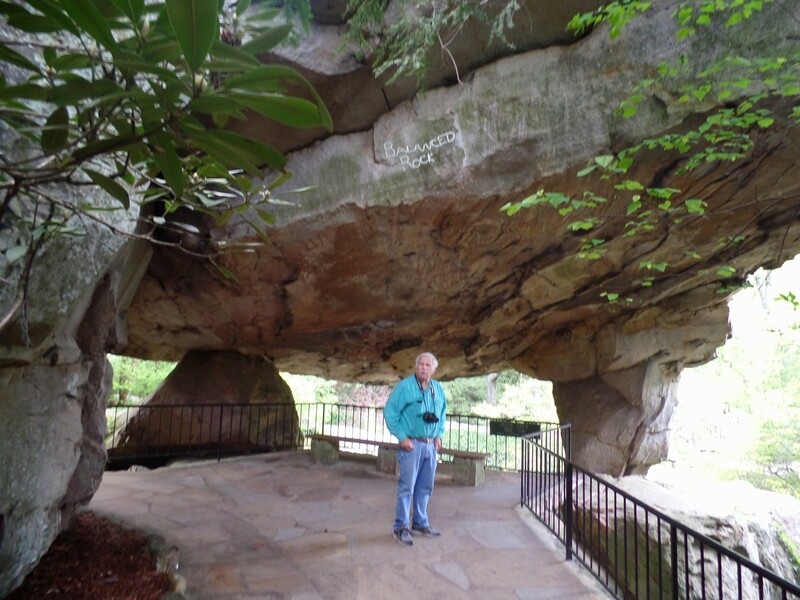 Rock City – Let's Go RVing! Wow – what a day, we probably did the most fun thing we’ve done on our entire trip. The day started off as usual and we were our usual slow selves. In fact it was almost 11:00 before we left the coach and then I had to go back to get water, then go back to get the GPS, then we had to stop at the office to buy the tickets for the day and then we had to go back to the coach to get money and put the rear jack down. Getting a picture of our morning? When we finally left we headed to Ruby Falls first. I don’t know what I expected but I know that I didn’t think I’d be going down 200 feet in an elevator. Located on Lookout Mountain, in Chattanooga, Ruby Falls is a large sparkling waterfall located deep inside one of the most significant mountains in the Southeastern United States. In fact Lookout Mountain itself is in three states: Tennessee, Georgia and Alabama. “The approach to the waterfall is almost as awe inspiring as the waterfall itself. This subterranean trail contains a plethora of beautiful rock formations. Countless stalactites and stalagmites which took millions of years in the making appear in unusual and impressive forms throughout the tour. 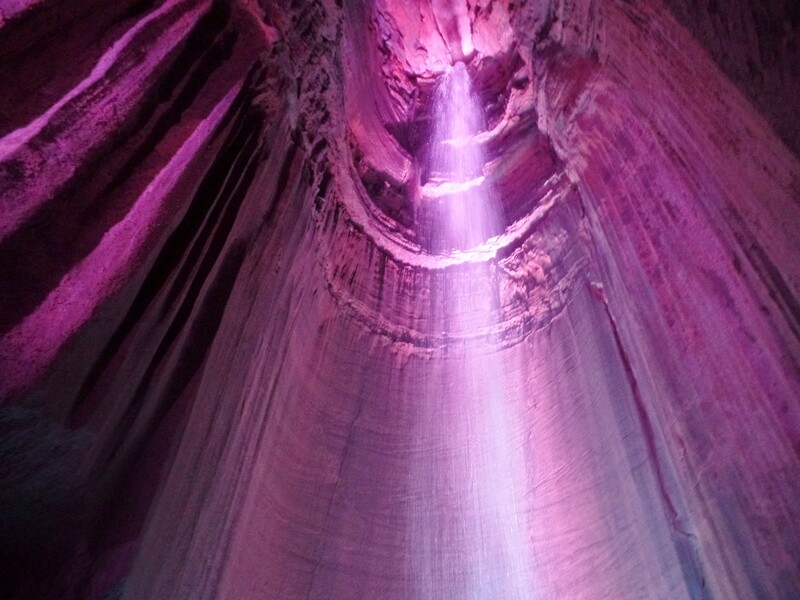 Ruby Falls is one of the deepest commercial caves in the country.” That pretty much describes our visit to Ruby Falls. Unfortunately we have seen one too many caves/caverns so the actual cavern was not as awesome to us but the waterfall was well worth the walk. It is 145 feet tall and located just below the peak of Lookout Mountain. Amazingly we were 1,120 feet below Lookout Mountain – that was incredible and then to think I had to ride on the elevator back up. Only later did Jerry ask me if I had my eyes closed during the elevator rides. Well, yeah, so missed seeing the rock walls through the glass door. Oh well, I was just glad when the doors opened! For someone who has a fear of riding in elevators, has a fear of heights and is just a bit claustrophobic, this trip has been eye-opening. Yes, I still have those fears! After seeing Ruby Falls we took the winding road to Rock City. I remember seeing signs advertising Rocky City when we took a trip to Oklahoma oh so many years ago. I noticed going into Chattanooga yesterday that those barn tops are still displaying the same signs. To say that Rock City is amazing is totally understated as it is just incredible. It was 1:30 when we got there and we were hungry so we ended up going in the grill just at the entrance. How we wished we had waited and eaten at the Big Rock Grill at the top, patio dining with an unbeatable view. After lunch we began the winding trail through the garden with over 400 native plant species. The rhododendron were in bloom everywhere and were beautiful. We wound though tight places, one name Fat Man’s Squeeze and it was indeed that. I walked across the swinging bridge! Yep, I went across and Jerry took pictures of it. In fact we took more pictures today than we’ve taken the entire trip. We made it all the way to the top and were able to look out and see seven states. The sign said we were only 50 miles from the Great Smokies in North Carolina. I had earlier told a lady we were about 15 hours from home. Oh well – 10 maybe. Standing on Lover’s Leap was a bit unnerving for me so I stayed out there long enough for a quick picture and that was it. We continued to wind through the amazing gardens and rock high paths and ended up on the Enchanted Trail where each step was a diorama of various fairy tales ending with a huge display that centered around a Mother Goose room that included many scenes from nursery rhymes. Again, it was just stunning and very difficult for me to describe. Although I was not excited about going because apparently my memory is bad or we didn’t go see Rock City years ago I am so glad we went and I would recommend it to anyone who is going to be anywhere near Chattanooga. Our final destination was the Incline. We started at the top and went down so were not aware of how steep the ride was. Coming back it was really obvious that it was a 72.6% grade incline. After the ride up and down we went up to the Observation Deck where six states could be seen. They didn’t mention which states they were though. I think we would have enjoyed the Incline more if we had started at the bottom and if it hadn’t been the last attraction of the day. By the time we had descended 1100 feet below Lookout Mountain and seen the incredible views from atop Lookout Mountain the Incline was a bit anticlimactic! We finally got back in a little after 5:30. I immediately washed the morning dishes (can’t believe I left dirty dished in the sink) and then started a load of laundry. Then I sat down with a glass of wine and some pistachios. We warmed up spaghetti for a light dinner then took a brief walk around the campground. Rain has been threatening and the temperature has dropped significantly so our walk was short. In for the night!